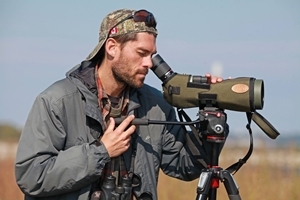 Learning birdsong can be quite a challenge. For some, mnemonics work quite well, for example, the commonly-heard sweet-sweet-shredded wheat of a Yellow Warbler as it sings from a roadside thicket. For others (myself included) visualization is perhaps the essential element to learning each song and getting them glued to the memory bank. I find studying the audio spectrogram of the song I’m looking to learn extremely useful and a great learning tool. Take, for example, these three spectrograms taken from the website, Xeno Canto. Regarding reading the spectrogram: the pitch is shown vertically (y-axis) and time is displayed horizontally (x-axis). Volume is indicated by the intensity of black (solid black denotes hard notes and high volume; translucent black denotes softer notes and lower volume), and tonal quality is shown by the shape and size of the notes. For example, a Baltimore Oriole’s thin and sharply-outlined flute-like notes would contrast with a Yellow-throated Vireo’s thick and blurry husky notes. 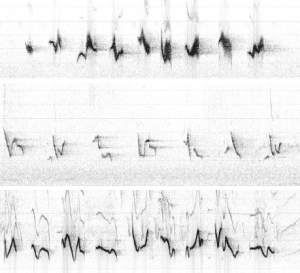 Photo: A comparative audio spectrogram of similar-sounding songs, from top to bottom: Scarlet Tanager, American Robin, and Rose-breasted Grosbeak. Note the powerful, husky, fast-sequenced song of a Scarlet Tanager; the relatively soft, flute-like, slower-paced song of an American Robin; and the powerful, fast-paced, well-defined harmonic notes of a Rose-breasted Grosbeak. Reference Numbers: Scarlet Tanager (XC20432), American Robin (XC131877), Rose-breasted Grosbeak (XC134869).